Here's what some people say about this subject. 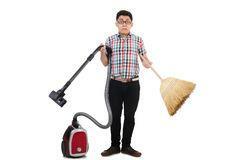 Brooms just tend to raise the dust whereas a vacuum will capture the dust along with the dirt. Brooms are rather old school because vacuums are much better than they used to be. Even a swiffer type dust mop is better than a broom. A broom shifts the dirt and a vacuum lifts the dirt. a broom may scatter the dirt around and not reall y get it all where as a vacuum picks it up. Some people feel that a broom gets hair and other things better and that a vacuum just get clogged up when it comes to hair and bigger heavier things on the floor. What ever you decide, we will get your dirt and hair off the floor for you. We guarantee it or we'll come back and reclean all your floors! Call us at 602-404-8675.